Indians are afraid of their own shadow, like children who find ghosts below their bed. a) India needs 99 per cent more reforms. FDI in retail is a TRIVIAL reform. NOT a great reform. I consider it not worth mentioning. India needs LIBERTY. FDI is not even 1 per cent of liberty. It is pretty much irrelevant in the bigger scheme of things. It is like a tiny part of a canvas, a small daub of paint of no consequence. b) I am NOT scared of my own shadow like most Indians are. I'm NOT afraid that Walmart will take over India. Now, on the second bit, some more. The cacophony of ridicuolous "reasons" against FDI has reached a crescendo. There are 1000s of the most ridiculous "reasons" being "offered". I'm simply unable to respond to them individually since there is ONLY one answer: FDI is CAPITAL which India will get free of cost. All RISK is borne by the investor. The government pays NOTHING. The consumer need not buy anything. If the investor can't sell anything, HE LOSES! Not India! Let all those opposed to FDI take a FIRM OATH – that they will NEVER buy anything from any foreign company. Let Ramdev, Modi, Hazare, Mamata, Kejriwal, all these and others NEVER buy from any foreign company. Worst is the innuendo against those, like me, who advocate liberty. As if I'm in this for pelf and power. Please remember that I HAD IT ALL. I was in the IAS and would have been, today, representing India in international forums. I was literally guaranteed an increasingly senior role in India's governance. I'm 52 now. By 65 I might have been Governor of some state. I GAVE UP all this. To land up as a refugee (at least to my mind) in a foreign land, without any job. And no savings. And no "pension". I had to start a new career in a different country from scratch. My first job, which I got after two months – as tutor in a university – paid far less than what I used to get in India (even when converted at the normal exchange rate, leave alone PPP). But I was determined NOT to return to the IAS. In India I was the "elite". Here I have had to face significant obstacles – not the least of these being age-based and "race" discrimination. I am capable of GIVING UP things that I don't think fit my moral framework of life. And I spit OPENLY on the corrupt (not literally, of course!). And I boldly and fearlessly speak my mind on EVERYTHING. No one is exempt. Not even God. 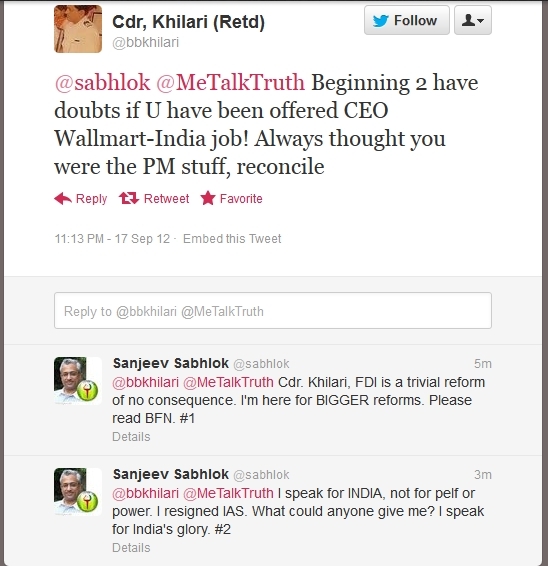 So why in heaven's name will I be saying anything about FDI but what I see is the truth? All my recommendations are FOR THE WELFARE AND GLORY OF INDIA. I don't care what happens to me. Just that this nation of 1 billion, my India, MUST become the GREATEST nation on earth. उठो सुपूत, जागो! अब कोई डर नहीं! BE FEARLESS. BE BOLD. BE THE NATION YOU CAN BE. Everything is becoming clear to me now. After 600 years of Islamic rule and 200 years of colonisation by the British the Indian is scared of his own shadow. Like a child who sees a ghost below the bed, Indians see something to fear in everything. Instead, they ought to read Arthashastra. Even though it says a few statist things, it is mostly a free market advocate. That's the key to success. And Arthashastra is super-clear about SECURITY. India's defence must be super-robust. But having a strong defence doesn't mean being a coward, hiding behind the tree each time a foreigner is spotted. India now has a billion people scared of their own shadow. My job therefore is now twofold: I must cure the mental disease of FEAR in India. Only then must I show the pathway to liberty. Without first curing FEAR, India won't be ready to be free. Reason only comes into effect when people are able to think. Today Indians simply can't think. Their reactions are conditioned. The thought of freedom scares them. Like a caged pigeon is afraid to fly even when the door is opened, Indians are scared and raise 1000 "objections" to every inch of liberty. I need to adopt (a) Vivekananda's style and (b) Arthashastra as India's key pathway to challenge Indians to stop being scared of their own shadow. Thousands of reasons why a some foreign unknown petty shopkeeper is bad for India! Not ONE bold Indian out there who says: India is now INDEPENDENT, and a MAJOR DEFENCE POWER. There is NOTHING to be afraid. Nothing to lose but your irrational fear of the ghost of the British. There is NO Britisher under your bed. Not one Vivekananda to speak out against this fear. Not one Chankya to warn against the dangers of poverty. So I must now become both Vivekananda and Chankya. Every FTI member must become Vivekananda and Chankya. अब नया सवेरा आ रहा है! उठ के देखो तो! ← The British still rule over India. They totally messed up Indians’ minds.